When freestyle.ch announced in late August that the mini-MegaRamp was soon to hit Europe, the freestyle community broke out in wild cheers. Now, with just two days to go and the colossal assembly in full gear, the first-ever Big Air for skateboarders on European soil is looking to be a major hit. City Councilor Gerold Lauber will herald in the MegaRamp's reign on Saturday, September 24. Saturday's Crossover Session &ndash; freestyle.ch's interdisciplinary show contest and crowning attraction &ndash; will be sharing the spotlight this year with the mini-MegaRamp. The new skateboarding ramp will make its official European entrance at 1:00 pm on Saturday when the head of the Department of Education and Sports, City Councilor Gerold Lauber formally turns it over to such freestyle experts as skating legend Bob Burnquist (USA) or Pierre-Luc Gagnon (CAN). &quot;We've all been training like crazy on a ramp the same size here in the States, which shows just how fired up we are about this year's freestyle.ch!&quot;, says Gagnon. In the snowboarding and freeskiing categories, seasoned Swiss freestyle.ch aces Iouri Podladtchikov and Elias Amb&uuml;hl will be hot on the title trail. However, two young guns within their own ranks are sure to give them a run for their money: A very bright future has been predicted for 17-year-old snowboarder Pat Burgener from the canton of Vaud and Zurich's 15-year-old freeskier Kai Mahler. A face-off between Mat Rebeaud from Switzerland and the Spaniard, Dany Torres, is sure to dominate the action in the FMX category. Torres has been enjoying his greatest season yet. Just this past weekend, he was crowned overall champion of the Red Bull X-Fighters Tour &ndash; the FMX equivalent of the World Cup. He's proven himself an inescapable force to be reckoned with at the finals on Sunday. American rapper Lil Jon will heat up Zurich's crowd on Saturday, setting the mood for the evening's Crossover Session. The &quot;King of Crunk&quot; is known for his powerful live performances. Other attractions will include the premiere of Standing Sideways!, the new film from Burton Snowboards, as well as the BMX show on the Mini MegaRamp starring big shots Vince Byron (AUS) and Morgan Wade (USA). Always a crowd favorite, the annual Label World trade show will provide a platform for 100 freestyle sports brands to exhibit their latest products and services. Sports buffs of all ages will have the chance to get in on the action at one of the Active Zones, where every kind of sports gear from stand up paddle boards and street surfing boards to BMX bikes and slacklines will be available for the trying. Organizers are expecting over 35,000 visitors thanks to attractive ticket offers and a promising weather forecast. The 2-day pass is now only 60 francs - 15 francs down from last year. Those looking to avoid long lines and interested in saving 6 bucks can take advantage of the advance ticket sales at Starticket. There will be a 6-franc surcharge on tickets purchased at the door. 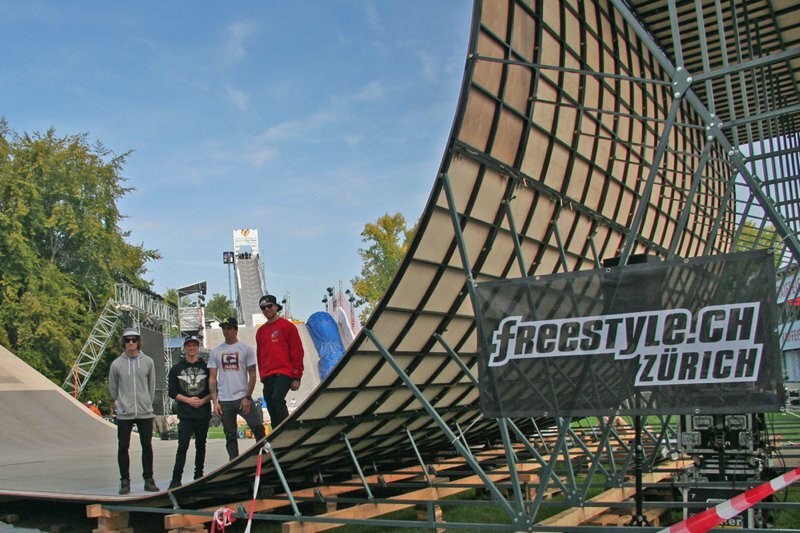 For more information on freestyle.ch, check out http://www.freestyle.ch, http://www.freestyle.ch/facebook and twitter.com/freestylech.